A downloadable evaluation system is available, contact SoftPLC for link/password information. 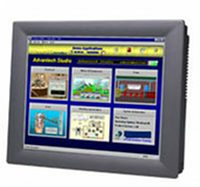 SoftPLC Web Studio Model SSH HMI's are ruggedized touchscreen Panel PC's with the Web Studio runtime pre-installed. Get the functions of a full SCADA runtime at the price of an HMI! Sizes are available from 3.5" to 17" with a variety of mounting options. New ATOM based models are faster, lower power, and more economical. Competition for new machine sales and automation projects is fierce. SoftPLC provides products and a partnering program that helps automation integrators close more business . . . an EDGE. SoftPLC Corp. offers open architecture, feature-rich products that help System Integrators provide their customers with superior industrial control solutions. Our Integrator program provides a way for SI's to work with us for mutual advantages. We hope you'll take some time to investigate how SoftPLC can give you the EDGE to increase both your business and profit margins, while adding features to the automation systems you create. Contact us to explore the possibilities.